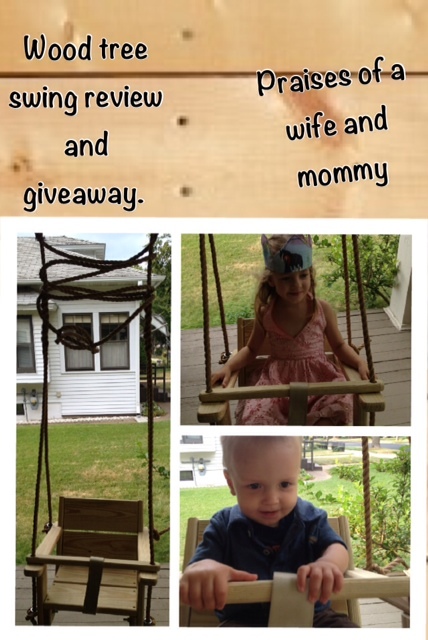 Welcome to the Wood Tree Swing Giveaway event. Thank you to www.woodtreeswing.com for sponsoring this awesome giveaway. 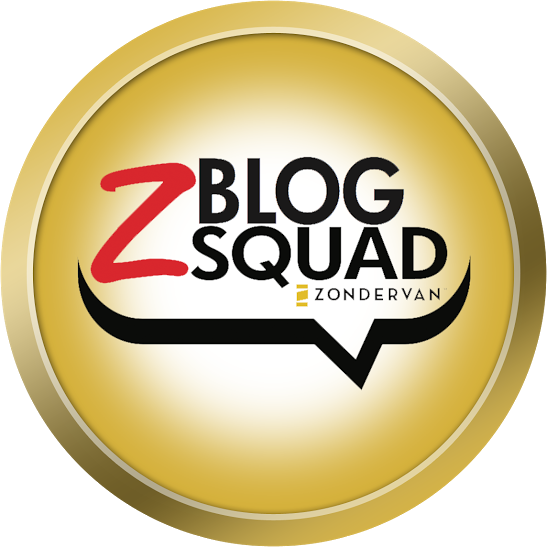 Praises of a wife and mommy and several other bloggers are teaming up to bring you this awesome giveaway! All opinions are 100% mine, Praises of a Wife and Mommy. Summer is not over yet there is still plenty of time to enjoy swinging! 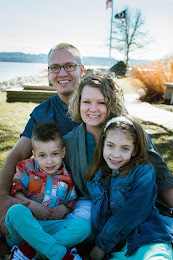 Wood Tree Swings was created by a retiree who is looking to supplement his income. He spent 40 years in the construction field and now spends free time hand crafting really awesome swings. He uses the finest materials and creates wonderful swings that will create many memories for you and your kids. Some of his swings include: Adult Tree Swing, Toddler Horse Swing, Wood Tree Swing, Disc Swing, and even a Recycled Tire Swing. 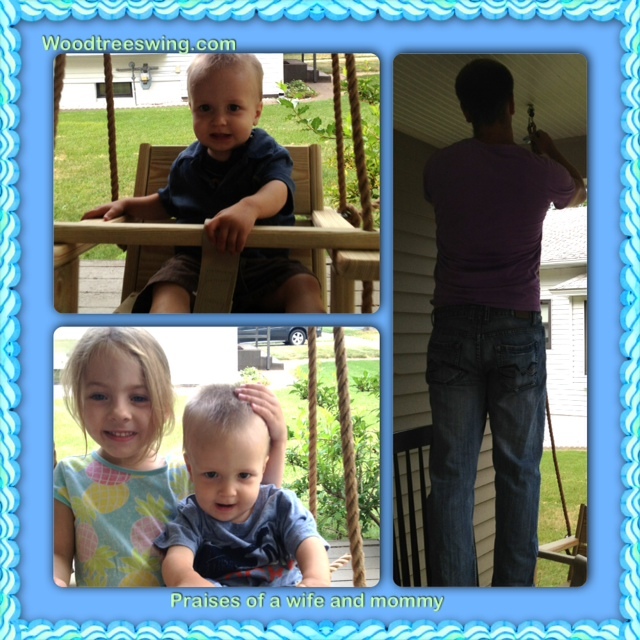 Wood Tree Swings also can personalize your swing with their new wood carver! What a nice present for your children to get a swing with their name written on it. If you do not have a tree like me then the porch works just as great! My husband installed the swing in only a few minutes and my kids both were enjoying it. My son did not know what to think and my daughter was jealous of my son. We have the toddler swing but my 4 year old fits in it!! Good thing she fits because she was getting a little jealous. The package arrived in a big box that had an extra box inside for protection. As soon as I took the swing out of the box my son was curious and sitting in it before we even had it installed. Once it was installed he was a bit fearful which is normal at the parks too. It usually takes him a few minutes to warm up and then he loves it. In this case he went in came out and then watched his sister have fun and then took another turn where he was a happy camper. :) I like that we installed it on our porch it just looks beautiful and if we wanted to match the house we could easily paint it. Time to enter the giveaway through the easy rafflecopter form below. Thanks for the review! I wish I could win this. 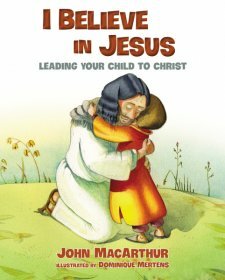 New follower from Naptime Review blog hop. My favorite is the toddler swing but the adult double swing is really nice also! I like the tire swing. My favorite is the Toddler Tree Swing, but I also like the Toddler Horse Tree Swing! I love the toddler tree swing but also love the adult chair swing. All of them are so adorable! Fingers crossed because my little girl would LOVE this! My favorite swing is the horse swing. I like the disc swing. 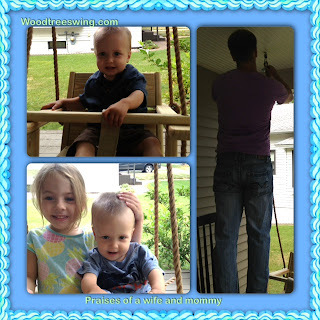 I love the toddler wood swing and the adult wood swing! The Toddler Horse Swing is awesome! Love it! i love the adult swing or the horse swing!! Love the Premier Wood Swing is so classic looking. Love it. Ah I love the disc swing, so many fond memories of those! What a fun company! I adore the Toddler Horse Tree Swing...so cute! the horse swing is adorable! my favorite is the double premier swing! The whatchamacallit tree swing and rope is my favorite. Toddler Horse Swing!! I love it and my boys would really enjoy it!! that horse swing is so darn cute!!! I love the toddler tree swing! That horse swing is soooo cool. I bought a couple really cute round wood swings from www.treeswingstore.com but I wish I had seen that horse swing!